''Mickey and Minnie Sweetheart Campfire'' Canvas Classic by Thomas Kinkade Studios – Framed was released today, April 15, 2019, on Shop Disney. The price is $249.95. While Thomas Kinkade re-created many of his favorite stories on canvas, he also envisioned classic Disney characters set within traditional Kinkade images. In ”Mickey and Minnie – Sweetheart Campfire,” his dream is proudly brought to life. A mountain stream cascades over an array of ancient stones framing a rustic wooden cabin nestled between the trees. A fireplace warms the living room, illuminating the porch, calling to its inhabitants who have spent long day of exploring the vast trails of an ancient forest. Mickey and Minnie are seen relaxing together on an old log, roasting marshmallows over a crackling campfire while Pluto awaits a toasty treat. Comprising Thomas Kinkade Studios' most sought after images, the Canvas Classics Collection is carefully reproduced on cotton fibre canvas using the methods and materials applied by the artists on the original paintings. Elegantly framed with museum quality materials, each coordinates with the most popular frame styles in the Thomas Kinkade Studios selection. 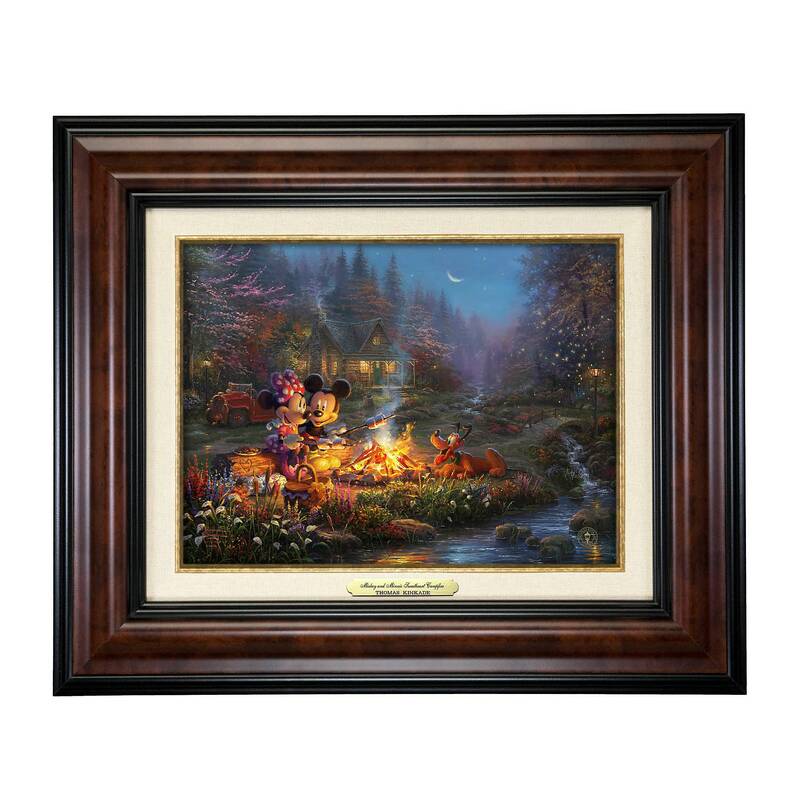 If you want to order ‘''Mickey and Minnie Sweetheart Campfire'' Canvas Classic by Thomas Kinkade Studios – Framed’, you can do so by clicking this link which will take you right to the product.